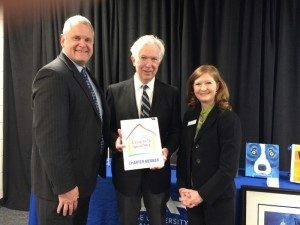 NCAC founder Robert E. “Bud” Cramer provided a generous donation to the Salmon Library at the UAHuntsville today to go towards the completion of the Bud Cramer Collection. The collection contains the papers and artifacts from Cramer’s nine terms in the US House of Representatives. Phase One of the collection was completed at UAH by NCAC librarian, Muriel Wells, in 2009.